C. Joybell C. once said, “you’re never fully dressed without perfume.” A good one, that is. I’ve always resonated with this quote because I believe that the perfume a woman wears speaks volumes about her personality! 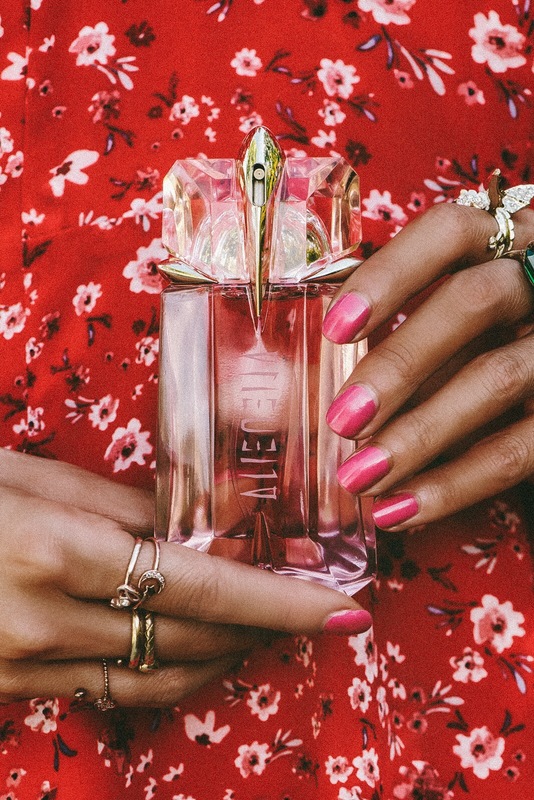 Today, I wanted to share with you a spring/summer fragrance that I’ve been loving lately. It’s the flower of the future, better known as Mugler’s Alien Flora Futura. It’s a relatively new one that became available in April of this year. Personally, I’m an avid lover of perfumes with floral notes, but I also appreciate ones with just the right amount of zest. Alien Flora Futura is just that and more — and I’m so excited to get into the details! First, let me begin with the packaging. After all, packaging is always half the fun, right? Upon opening the box, I was mind-blown to say the least. Mugler really did a spectacular job designing their bottle! It features distinct architectural shapes, encapsulating the precious “flower of the future.” The striking gold accent and peachy pink hues evoke a sense of a fresh start and optimism that everyone should carry with them everyday. As far as the scent goes, the quintessential Alien Flora Futura is the perfect combination of crisp, tangy freshness and unique white florals, balanced out with white amber to reveal the creamy notes of sandalwood. The result is a signature fragrance that is sensual and truly breathtaking. As someone who lives in the desert, the fragrance reminds me of a beautiful desert oasis in Spring time. It smells soooo dreamy & refreshing; there are no words that will do this delight justice. You’ll really just have to experience it for yourself! Have you tried the Alien Flora Futura eau de toilette or any of Mugler’s other fragrances? That bottle really does look super fancy and I bet the scent is amazing! Need to get my hands on this one soon. Thank you for sharing! I’m a huge fan of Mugler’s original fragrance, but haven’t gotten a chance to try this one yet! Sounds delightful, I’ll give it a go after my current one is out!! Ahh I’m so glad to hear you’re a fan of Mugler’s original fragrance. I’m the opposite – I will have to give that one a try after I go through this one! It’s so essential to have a signature scent! Great choice, girl! I have been wanting to try a new fragrance. Fresh scents are my favorite. Will need to definitely check into this. Thank you for sharing. I am a fan of fresh scents too and this one definitely does not disappoint. If you do give it a try, I’d love to hear your thoughts! Great article! Many of my friends use the scent and I was tempted to try it too – But somehow I am a Chloé Girl – this scent is my signature and I am not really willing to change haha. oh the bottle looks so amazing, and the scent that you described sounds lovely. This fragrance looks amazing! Gorgeous shots!! I have always loved how Mugler comes out with such unique packaging. It’s so pretty that to makes me not want to use it. I have to try the Alien Flora Futura fragrance. The notes sound like they’d work beautifully on my skin! The packaging is beautiful and presentation is such an important factor! This one looks and sounds amazing! I love the packaging of this perfume. Looks very classy. I would love to try this. Sounds like it’s a good scent. I love how beautiful this bottle is! The scent sounds amazing I need to try it in the fall. I don’t wear too many scents over the summer. Thanks so much! I hope you love the fragrance as much as I do! I’m trying to be better at using perfumes because you’re right that a scent is an extension of your outfit – it’s an accessory! That bottle is really pretty and it sounds like it smells amazing! Haha I got a lot better after moving to the desert – especially in the summer time. I think it really helps to not only keep me smelling fresh, but also complete my outfit! This brand has such pretty perfumes! I love the bottles too – I found them recently and love the scents! I know right? Their packaging is seriously on point! Glad you’re also a fan! I definitely need to try out this scent! Love your dress by the way! You’re never fully dressed without perfume! That is so very true. I always make sure to wear perfume before I leave for the day! So glad that you can relate to this saying too! It’s very indeed true! Sounds like a beautiful Spring fragrance. They always have such pretty bottles. I remember one of the girls in my class having the original fragrance when we were in High School, man, we were all so jealous! Hehe. Lol! Aww that’s too cute! I can’t imagine having such a luxurious fragrance in high school! I don’t think I was even allowed to wear perfume back in those days haha so I would have been jealous too! I use the original Alien scent but I am super curious to try this one out now!! Ahh how do you like the original one? I am going to try that one next! This fragrance sounds amazing!! I’m all about delicate, soft scents! Thanks Laura! Soft & delicate scents are the best! I really like perfume. But i love the smell of the flowers and my perfume must not smell sooo heavy. Thank you darling! If you do give this one a shot, I’d love to hear your thoughts on it! oh yes, I am looking for a new scent for summer. this one sounds perfect! Ahh if you give this one a try, I’d love to hear your thoughts on it! Looks like it is an amazing fragrance. I am always looking for a new one to add to my collection. I think you won’t be disappointed by this one! Me too! Sandalwood is the best!